Although I know the Peach is way too young to actually pick favorites with her toys, but in my heart of hearts I think she’s a fan of Raggedy Anne. 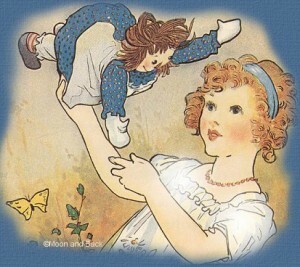 Perhaps because of my own Raggedy romance as a child, I’m a bit uneven keeled on the matter. I had a parade of Raggedys running through my life after I loved on old ones too much. As reliable as Rudolf’s red nose would guide Santa’s sleigh that night, a new Raggedy Anne would smile at me from her plastic and cardboard box every Christmas morning. I met a woman named Mary at a cocktail party who had her own Raggedy Anne story. 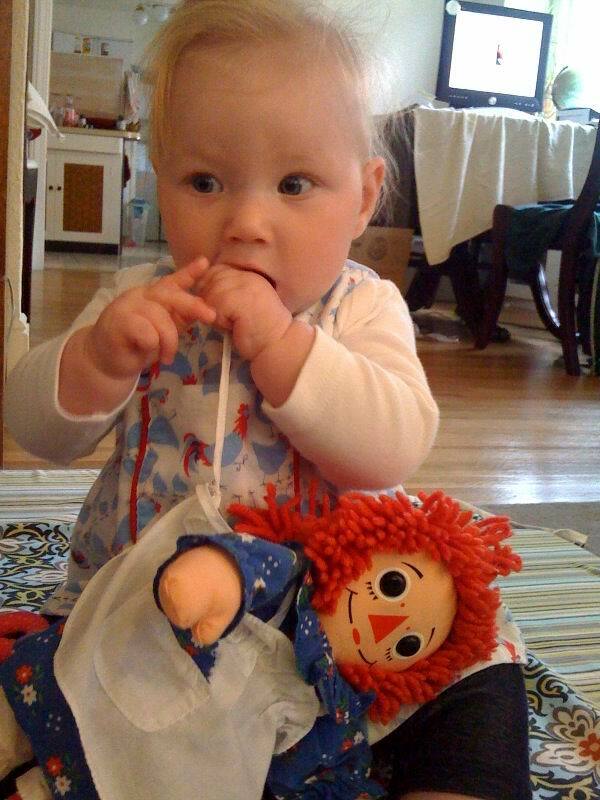 She too was a loyal fan of Raggedy and would play with her until her red and white tights were leaking stuffing. At that point, Mary’s mother would sit her down and tell little Mary that Raggedy was very sick and needed to go to the doll hospital for some treatments. Mary would carry her beloved doll outside to her mother’s car and click the seatbelt around her little rag body, wave goodbye to her and pray that Raggedy would survive her hospital stay. Two hours later, her mother would appear with Raggedy looking wonderful, as if she went to the doll spa, with seamless tights, a perfect red yarn hairdo and a crisp white new apron. Decades later over Christmas dinner, Mary’s mother talked about her trips to the doll hospital being a great time for her to get away from the kids, have one of her forbidden cigarette while driving after she HUCKED THE OLD DOLL OUT THE WINDOW on her way to the toy store to buy a new Raggedy Anne doll for her daughter. I kid you not. Mary nearly burst into tears after that tragic tale of woe. But I must admit, I’m kinda thinking the “doll hospital” schtick is a pretty good one. We’ll see how the Peach reacts to that! I’m just cracking up, thinking about all those dolls on the side of the road! Hilarious. So happy to see another Raggedy Ann fan. I had one as big as me when I was little. Your stories–hilarious! Loving the cuckoo clock in that past post. Great blog–linked from your comment on Jade’s blog. I’ll be back for more funnies and craftiness!